This photo was taken about 1980 shortly after No 1011 of the SAR class 7A & was brought to Keetmanshoop to be plinthed in front of the station building. This locomotive was built by Neilson & Co, of Glasgow, Scotland, as works no 4930 in 1896. 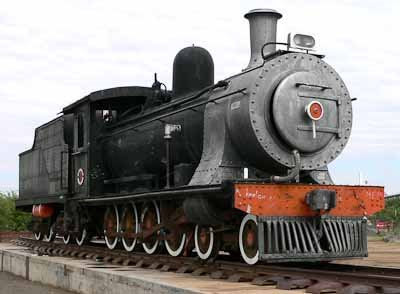 The first Class 7 locomotives were commissioned by the Cape Government Railways and delivered by Dübs & Co of England in 1892. 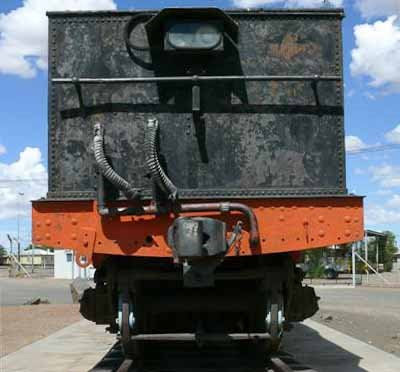 Follow-up batches were built by Sharp, Stewart & Co, Neilson, Reid & Co, and North British Locomotive Company. 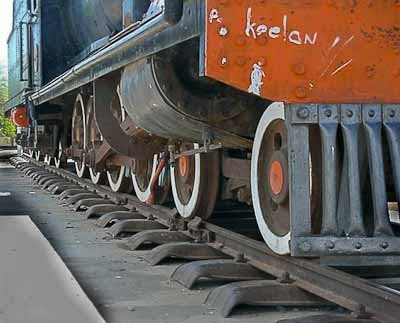 They had a wheel arrangement of 4-8-0, coupled wheels of 3'6 3/4" (1086mm diameter) and Stephenson link valve gear. 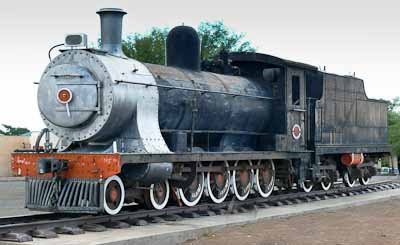 The engines were originally powered by saturated steam, but many were later reboilered and converted to use superheated steam. 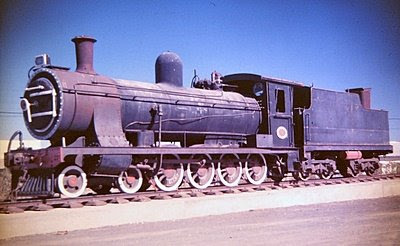 Modifications such as larger boilers, increases in cylinder diameters and larger cabs resulted in the reclassification of the locomotives as Class 7A, 7B, 7C, 7D, 7E and 7F. 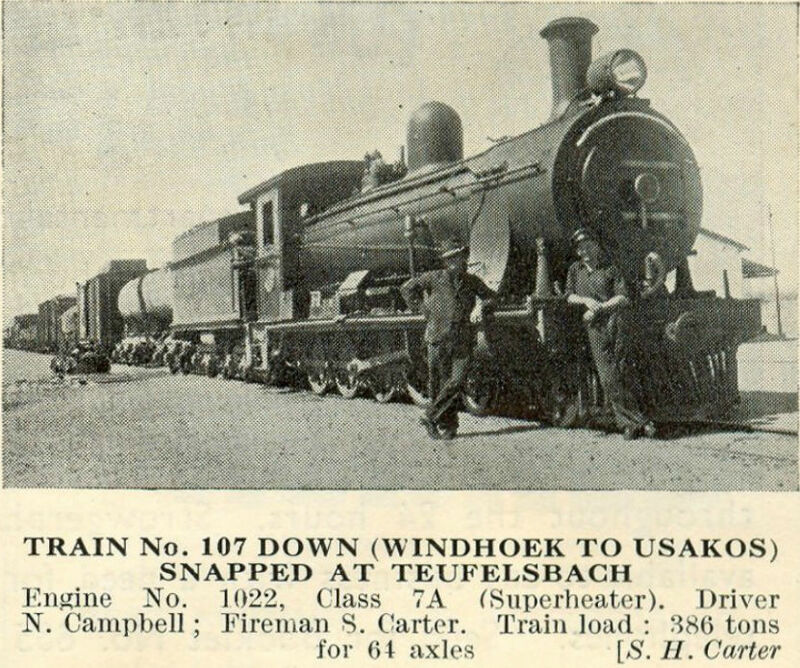 During the SWA campaign in World War I, Class 7 locomotives were transported by sea to Walvis Bay as no rail connection existed between South Africa and the then German South West Africa. 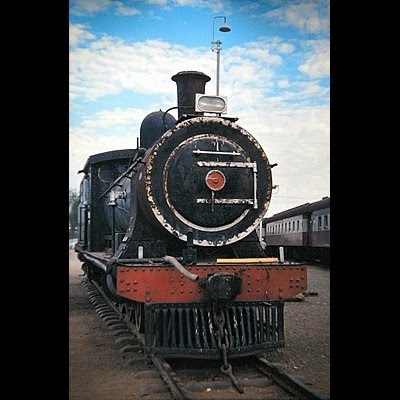 Nos 968 and 984 were dispatched in December 1914, followed by 973, 1002, 1024 and 1042. 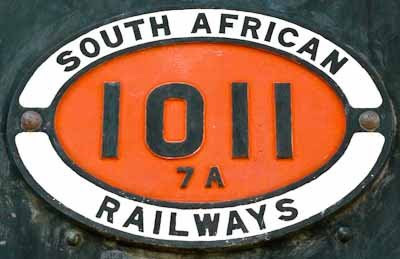 These very efficient locomotives ran on all 1067 mm main and branch lines for 45 years; so successful were they that in 1948, with the arrival of the Class 24, no less than 53 of the Class 7 series were in use in South West Africa; with the introduction of the Class 32 diesel locomotive in the early sixties, the Class 7's were transferred back to South Africa. 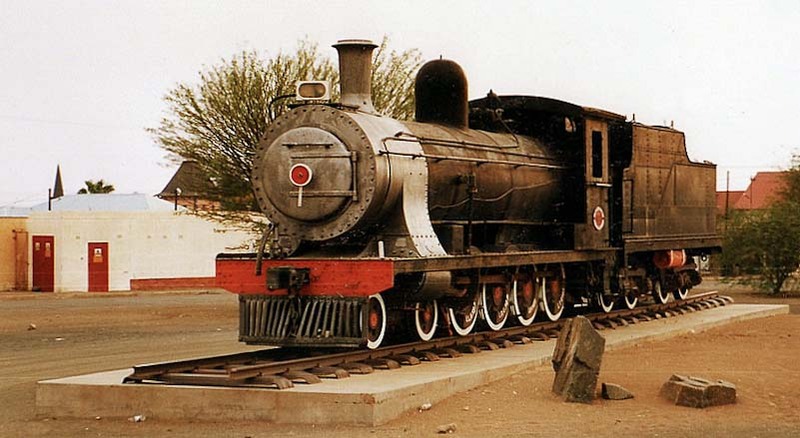 The only remaining Class 7A locomotive in Namibia is No. 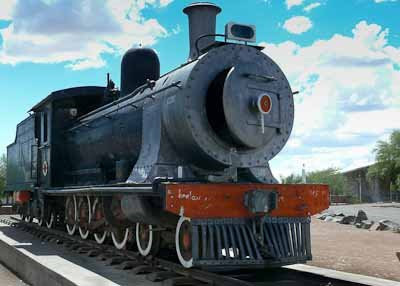 1011 at the Keetmanshoop railway station. 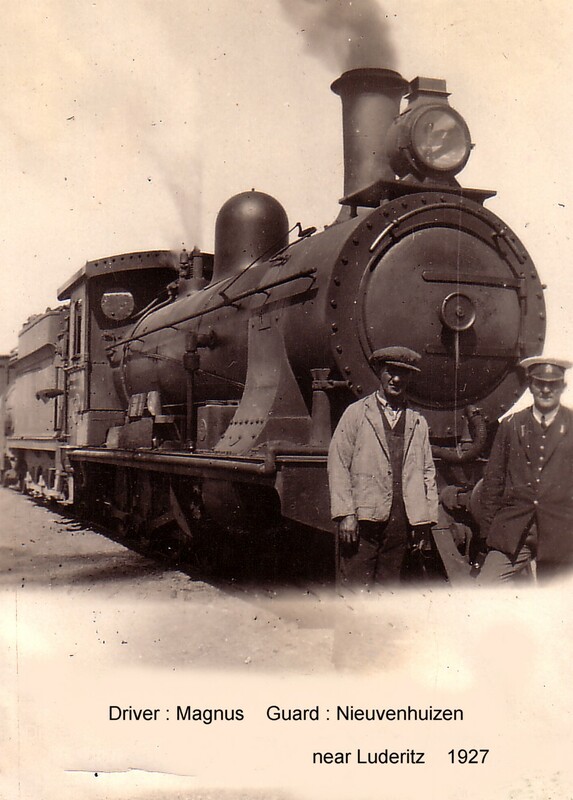 A Class 7 train crew photographed near Lüderitz in 1927. 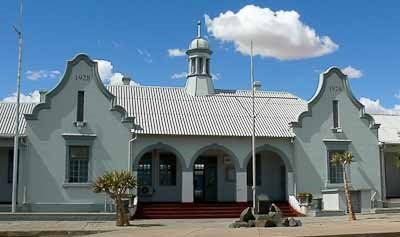 Image: Pierre de Wet Collection. 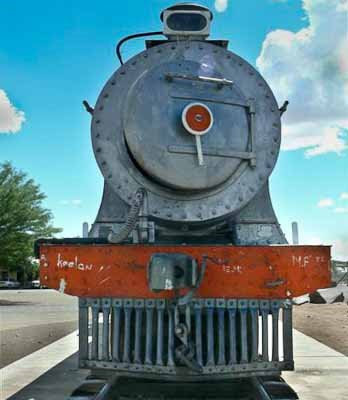 Another SAR Class 7A engine no 1009 is plinthed at the OUTENIQUA TRANSPORT MUSEUM in George, South Africa. 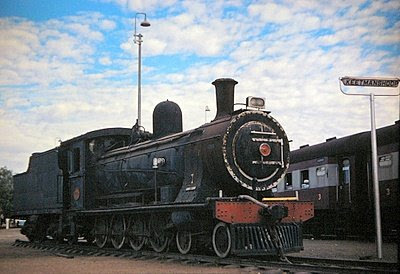 Also see a Class 7 plinthed in Riversdale, South Africa. 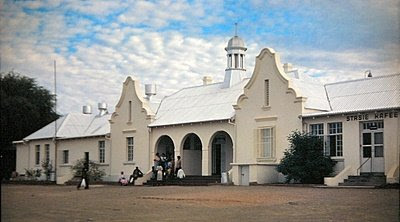 October 2003: photo kindly provided by Jacque & John Wepener. 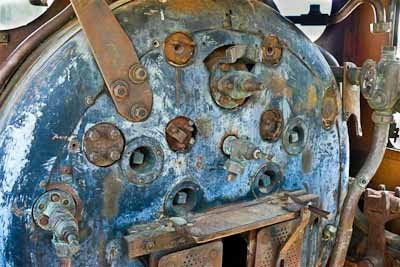 Notice in the next photo how another pipe was stolen of the locomotive sometime during the next 4 years. 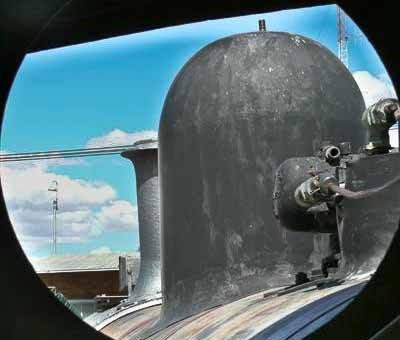 In 2009 its twin is still present on the other side. 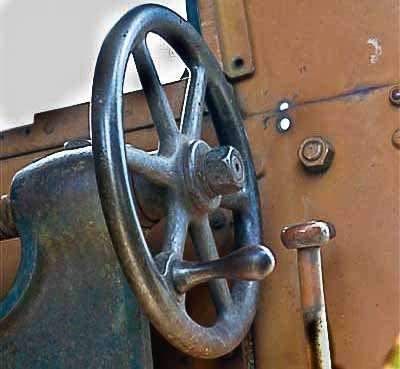 Presumably this is the control of a mechanical brake? 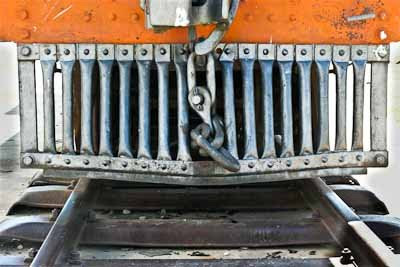 Obviously well used over many years of diligent service.